Water damage can be extremely detrimental to your home. To make matters worse, water damage often goes unnoticed if it occurs in an area of one’s home that is not frequently used (i.e. basement). The longer water goes untreated, the more damage it can cause. There are several ways to stay one step ahead and detect major water leaks that may cause damage to your home. It is wise to check sources of water in your home at least once a year. Dishwashers, washing machines, toilets, showers, and any appliances that use large amounts of water should be inspected periodically to ensure pipes and hoses are properly connected. Water may also find its way into your home through a leaky roof or porous foundation. It is best to have your home inspected by a professional to make sure there aren’t any areas that could cause water damage. If your water bill seems unusually high, there is a good possibility that that there is a leak or burst pipe present in your home. Check all possible sources of water in your home to be sure. Obviously, your home is more likely to experience water damage after flash floods or extended periods of rainfall. If your area experiences severe weather or even a natural disaster, be sure to thoroughly inspect your home for water damage. 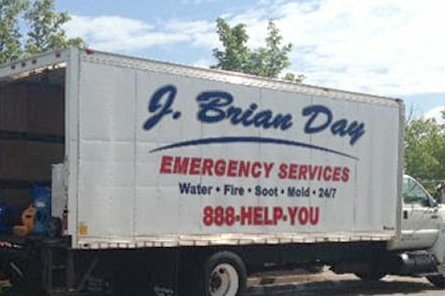 In the unfortunate event that your home experiences water damage, call J. Brian Day immediately for emergency water damage cleanup. J. Brian Day is available 24 hours a day and requires no cost up front. To learn more about our emergency water cleanup and removal services, call us at 1-888-HELP-YOU.